Whether you recently became a certified decorator, changed jobs, or are transitioning from owning a business, use a few tried-and-true tips to move your resume to the top of the stack. From customizing your resume to fit the industry of the job opening to using keywords in your skill set, make your resume shine. Artistic Skills: Mention any artistic skills, such as working with sculpting tools, hand-molding fondant or gum paste. If you have experience creating cake toppers mention if it was for wedding cakes, birthday cakes, etc. Sculpting: Include in the sculpting section a few examples of the type of objects and characters you can create. Specialized skills: Mention specialized skills, such as the ability to create marzipan figurines, flowers, intricate butter cream piped lacework and other skilled decorations. Sugar paste flowers: Do you have a wide range talent for creating different sugar paste flowers? If so, give examples or the number of flower types you can create. Airbrushing or hand-painting: You'll want to highlight unique skills, such as airbrushing or hand-painting. Icing effects: Can you create different icing effects? If so, include in a brief bullet point list with one or two examples. 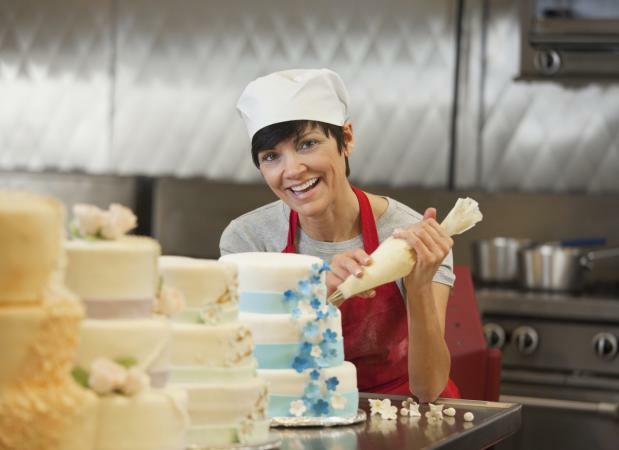 Certification and Continuing Education: Are you an RBA (Retail Bakers of America) Certified Master Baker? If you've completed a professional program or earned certification, you want to let potential employers know. This should be a brief description that gives what, when, where and the name of the certification you earned. By adding these and other keywords to your resume, the resume software will pull your resume up, while resumes without these phrases specific to the open job will be passed over. Monster explains most people save their resumes as resume.doc or resume.pdf. however, when a recruiter or manager is sifting through emails, there is no way to differentiate your resume from others. This simple change gives your name but also sets in the recruiter's mind you're a Cake Decorator. Have you decorated large cakes, such as one that serves a few hundred people? Did you create a new cake design or cake recipe? Did this increase sales? Did you create a successful promotion or design a product display featuring your cake decorating skills? Have you created dessert trays? Have you designed cakes and other pastries specific for catering events? Have you placed in cake decorating contests? Statements about your career highlights make recruiters want to know more. Any brief statements made in the summary are then explained under the appropriate employment listing found in the Experience section. Answer incoming calls, take orders and schedule deliveries. Maintain and manage showcase freezer and refrigerator. Schedule production for a team of (insert number). This can include things, such as dough preparation and coordinating inventory for ingredient requirements. Maintain inventory, restock and purchase all ingredients and supplies. Online Classes: If you teach online or provide tutorials add these to your bullet list. YouTube channel: If you maintain a YouTube channel with how-to and other instructional videos, include this information. Social Media: List your present on Twitter, Instagram, Facebook, blog and other social media. If you have a substantial following, you'll want to add this information. Online Portfolio: Increase your odds by giving a link to your online portfolio to further entice prospective employers.